One of the hardest things about living in New Jersey is the homesickness for Texas. I miss wide open spaces, and tacos whenever I want (not made by me!) and bluebonnets, obviously. But even more so, I miss my people. My tribe. My family, of course. But also, there are a few Texans that I know are my people, even though we’ve never managed to live in the state at the same time. Megan is one of those people. We’ve roomed together at conferences, and she’s one of the superstars that helped me bake 300 cupcakes. Megan, Steff, Kathryn.. these are Austinites that instill in me the drive to get back to Texas just as much as being with my family does, because these girls are my people. Let me tell you – Megan is the kind of mom I hope to be. Her little guy, R, is one of the coolest kids I know. And his freckles.. I die. I seriously die. Megan happens to be expecting her second son. A little boy that will be only a few months older than our own baby. James and I hope that when we finally get back to Texas, these kidlets will be fast friends, just like we have been with Megan and her hubby. We love them dearly, and can’t wait to meet their new little guy. This past weekend, Steff and Kathryn and a host of other Austin Food Bloggers surprised Megan in person with a baby shower. We all decided it’d be epically fun to surprise Megan a second time, with a virtual shower given by all her friends that can’t hang in Texas and eat kolaches of a mornin’. Because new babies mean exhaustion and not wanting to cook, Steff and Kathryn came up with the idea of a “casserole” shower. On each of the blogs below, you’ll find a delicious recipe that can be made ahead and frozen, plus some fresh salads to go alongside those reheated casseroles. Please, join me in congratulating Megan and her family on new Baby Stetted, due in a few weeks. 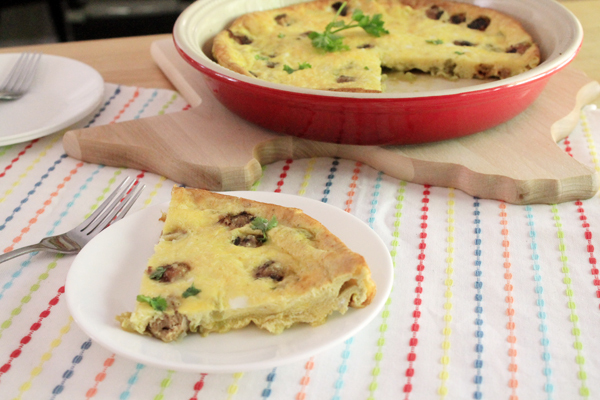 And make this Chile and Sausage Frittata – for yourself, for a friend with a new baby, or for some Tuesday night in the future when you know the last thing you’ll want to do is cook. It’s seriously good, and seriously easy. Visit all Megan’s Virtual Shower Guests! In a skillet on medium-high heat, cook diced sausage links until they are no longer pink. Because we’re using turkey sausage, which is leaner, you may want to spray the pan with cooking spray before adding the diced links. Spray a 9″ pie plate with cooking spray. Layer first the cooked, diced sausage on the plate, then cheese. Sprinkle 1 tablespoon of flour over this combination and toss lightly with a fork to evenly distribute. Pour chiles over the cheese and sausage, spreading as evenly as you can. 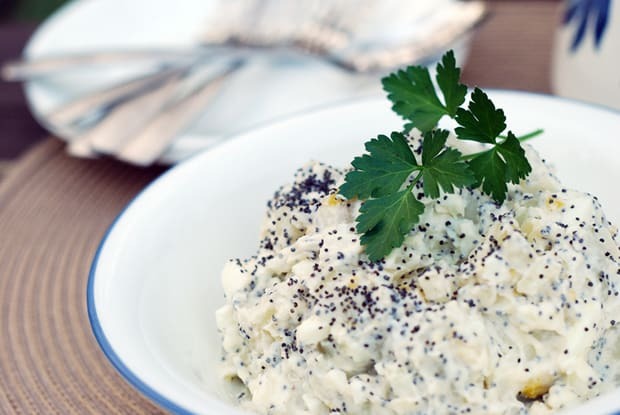 In a large bowl, combine eggs and half and half or milk. Add cumin, black pepper, and kosher salt, and then beat together until eggs are light and frothy. Pour the egg mixture over the rest of the ingredients in the pie plate. Sprinkle cilantro over the top. Place the pie plate in the freezer, uncovered. Once firm, cover with foil and store in the freezer for up to a month. Thaw frittata in the fridge, then remove foil. Bake in a preheated oven at 400°F for 20-30 minutes, or until the eggs are set. Preheat oven to 400°F. 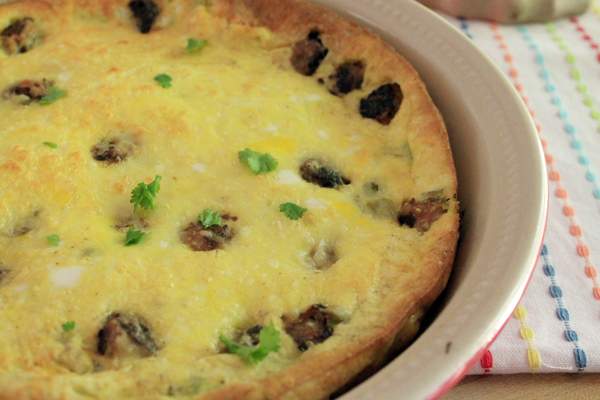 Place frittata in the oven and bake for 20-25 minutes, until eggs are set. Garnish with fresh cilantro. Sour cream is also a nice addition. What a wonderful recipe and a wonderful surprise for Megan! I love that everyone pitched in and created not only a real event, but a virtual one as well. So sweet!! Thanks, Kate! I know, I thought it was really cool too. Megan is very loved. 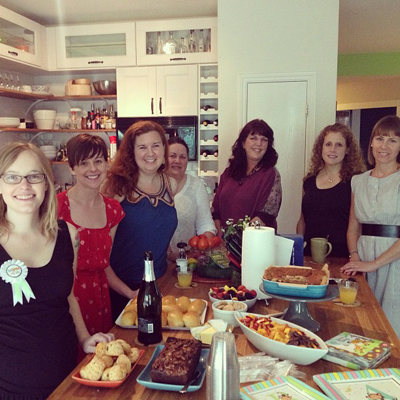 What a sweet blog post and virtual baby shower for Megan! Oh and I don’t think I have said it yet, but congratulations on your little one on the way! I really like this recipe because it’s so easy and you can freeze it. Nothing beats foods that are easy to make for later in the week. I plan on checking out the recipes for the chicken enchiladas too. Thanks for stopping by, Dalila. It really is a great recipe. My husband took the leftovers – single wedges individually packed in ziplocs, all week to work. A quick pop in the microwave, and he had a protein packed breakfast every day. This looks so awesome, Amber… I can’t wait to try the recipe. Anything that I can make ahead of time is just perfect these days. The flavors sound so yummy. Love it! I really loved how Tex-Mex they were, Jen. If I had it to do over, I think I’d add some garlic and chili powder to the cumin, because green chiles from the can aren’t very spicy. Kick it up a notch, you know? Oh, yes… That sounds perfect! I am all for kicking things up a notch these days! This looks seriously delicious, Amber. 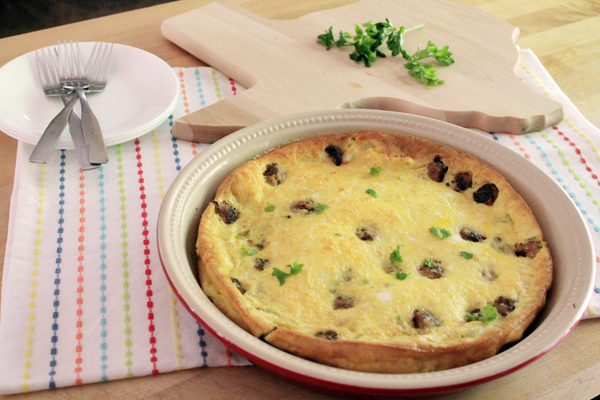 I know Megan would love it, too, because it’s almost exactly like a frittata she made for her own shower! (She was just expecting Steff and me, but of course she made enough food for several people. ) 🙂 I’m so glad we could do a virtual shower, too. And I can’t wait for you to be back home in Texas soon!!!! I love that IG photo of her shower – I missed that! Me too, Aimee – this one’s definitely going on the pre-delivery freezer stock up list.